Did you guys know quinoa is a SEED? I went to school for nutrition for 6 years and I somehow missed this little tidbit. Or maybe I learned it and then immediately forgot it? That’s even worse right? For some reason I respect the little nuggets of goodness even more now. Probably due to the dislike everyone has for grains these days. Don’t get me wrong, I LOVE grains still but I am not immune to their bad rep. It is basically bird seed, but in the best way. It is delicious, honey roasted bird seed like Big Bird used to eat on Sesame Street. I like this best with milk (been on a coconut milk kick lately) and a sprinkle of mini chocolate chips (don’t judge me). Let me leave you with a word of advice: do not eat this in the car unless you want to shop vac TINY seeds out of crevices for the next 40 years. I MADE MY OWN EGG NOG! It has never occurred to me to do this before, but it is insanely simple. Only prob is I think I might be the only human interested in making their own egg nog 🤔. I may have already told you this story because I will tell just about anyone this story if there is a lull in conversation, but here goes. When I worked as a dietitian in a school district, the local dairy company gifted our office a case of egg nog for Christmas one year. There was enough egg nog for the 35-40 ish employees of that building. Guess how many people took their generous egg nog gift home?? Like 4. Guess who took home the remaining 40 cartons of egg nog? This guy. I didn’t actually take 40 cartons, but I took a huge chunk. I couldn’t bear the thought of it sitting in the fridge for months before being pitched. Egg nog may have a gross name but it doesn’t deserve that. With my nog surplus, I made ice cream, whipped cream, cookies, cakes, YOU NAME IT. My memory is telling me I made Mac and cheese with it but surely that is a lie, right?? Anyway, my fave thing by far was to use it in French toast. Seeing as I no longer work in that office, no one is bringing me cases of egg nog each Christmas season (whomp whomp). Lucky for me, my fiends at Manitoba Milling DID send me some of their new creamy flax seed milk to try! I got it in the mail and literally shouted “EGG NOG” when I opened it. Austin replied “Someone sent you egg nog?” And I replied “No, it’s flax milk”. And he replied “Why did you scream egg nog so loudly? You made me drop my pen.” And I said “Because I immediately knew that I am going to make egg nog with this flax milk.” And then he pelted me with about 40 questions in a row about what the heck flax seed milk is and why do I get such weird things in the mail. In closing, I made super simple and quick egg nog with the flax milk and then used it to make delicious, portable French toast cups. No biggie. Thank you Manitoba milling for sharing your new flax seed milk! I just scrolled through the recipes I’ve shared here in the past and THEY ARE ALL CARBS. Do you guys guys think We only eat waffles and pancakes and bread and granola?! Ugh cause we sooooo don’t. We actually eat mostly non-waffle foods. But non-waffle recipes don’t come to me as easily as waffle recipes. much easier than pancakes because the waffle iron does all the work. I make a batch almost every week and throw half in the freezer for busy SCHOOL mornings since we have those now. Let me share real quick one of my favorite moments ever. Day 4 of preschool, after days 1-3 were fairly terrible, I went to pick up my sweet girl expecting the worse. I looked in the window thinking I would see her alone in the corner on a bean bag (her choice to be there) like I had seen her the last few pickups. But instead she was bounding toward the little group table wearing her massive backpack and smiling like a little angelic goon. The teacher was obviously pretty thrilled too, she let Ruthie go out the door first and this tiny adorable soul stood up slowly, carefully pushed the smallest chair I’ve ever seen under the table until it was just right, and then jumped into my arms 😭❤️. SO I’m sure there will still be rough days here and their but she seems to love school now! Ugh great now I’m crying. Someone get me a waffle. Ok I want you to know something about these pancakes. They take some major planning ahead. I wasn’t sure if they were going to be worth it but omg. They are. They’re not actually a lot of work per se (anyone else think of uncle Jesse whenever you hear per se?) but they need sometime to rise, that’s why I soooo cleverly named them overnight pancakes. I ALMOST called them flapjacks because the title “flapjacks” is so freakin’ appealing to me. Griddle cakes. Hot cakes. Pancakes definitely win for most delicious sounding name options. My MIL gave me a cookbook full of old school classic bread recipes including some delicious but time consuming stuff like stollen, babkas, phyllo, and also these puppies. The original recipe uses buckwheat flour which would have been amazing but I wasn’t able to find it at our grocery store so I used whole wheat instead. Someone try it with buckwheat and let me know how it is! Also someone tell me where to find buckwheat? These pcakes are both classic and unique. Classic in that they are fluffy and light, unique in that they are SUPER flavorful. They are made with yeast instead of baking powder and need to rise in the refrigerator for about 8 hours or overnight. This process results in the amazing sourdough flavor. You can make them into waffles as well without making any changes to the recipe. Whip up the batter on Saturday before bed and have some of the best pancakes ever Sunday. I had a BRILLIANT idea while I was making these. And that idea was that I should have bought a few bags of frozen sweet potato fries. Live and learn. 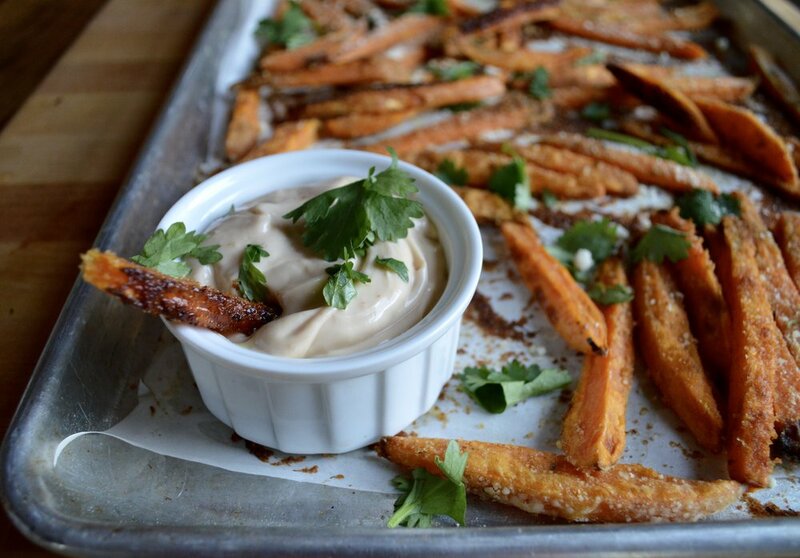 I used this recipe for super crispy homemade fries but they just take SO LONG. The forever soak really gets me as someone who very rarely knows what is happening too far in advance. But if you have the time to soak them for a few hours, it makes them so much crispier #science (turns out, it really is sort of science-y though, soaking removes some of the starch). I also barely have the patience for peeling veggies. I would normally leave potato skin on but there is something weird about sweet potato skin. In conclusion, frozen fries are the future. This recipe is basically a big ole pile of veggies. I am always amazed how delicious vegetables can be when prepped certain ways. Like asparagus. It's been on sale lately so I have a ton. One night, I steamed it and it was pretty good. A few nights later I roasted it and it was, like, amazing. So good that Ruthie and I ate the whole pan while cooking the rest of dinner and had to make more. We've tried out Hello Fresh a few times in the past few weeks after my sisters amazing MIL signed us up for a trial. It was so fun to not give one thought about what we were having for dinner that night and Ruthie was obsessed with unwrapping the tiny packages. It was like Christmas. SIDE NOTE: every time it snows, Ruthie asks if Santa and the reindeer will be here soon. I die of cuteness and also feel like a terrible jerk when I explain that Santa will not be back for a long while. Back to Hello Fresh, Ruthie's heart skipped 100 beats when she saw the tiny jars of ketchup. I kept them so I can fill 'em up next time we have ketchup with something because the JOY WAS THAT INTENSE. We have meatless meals 3-4 nights a week to help stay within our grocery budget, to get a ton of veggies, and as a way to ensure creativity in the kitchen. This one will be happening again soon fer sher. I’m obsessed with making weird things out of quinoa. Not that pancakes are weird (you are definitely not weird my sweet little pancakes). I love gluten but when you have a tight grocery budget (or hell, when you’re feeding kids and want them to like you) it’s easy to find yourself eating bread/crackers/pasta/ pancakes like, all the time. I’ve been testing out new breakfast recipes that don't rely so heavily on flour to make room for some good stuff. My thought process: if quinoa can be brownies, it can TOTALLY be pancakes (right?). Well it worked. They are super filling and have that delicious waffle-cone-at-six-flags vanilla flava. If you are a fan of the ole oat-egg-nana pancakes, you will LOVE these. They are closer in texture to this recipes, though more pancakey and not at all banana-eggy. Austin loves stereotypical pancakes. They better be fluffy, white as the driven snow with not a flick of flax or oat, melt in your mouth little puffs of processed air. He still liked these but told me I better make it known that they are more dense than traditional pancakes. I took that as a positive because typical pancakes are SUPER DELICIOUS but sometimes make me feel groggy and blah followed by OMG I’M HUNGRY AGAIN. You can whip these up in a food processor or blender. Even though my blender always smells like it’s on fire, I actually choose it for these so I could easily pour them into the pan. Are brownies a suitable Christmas gift? What about the greatest brownies ever made? AND a cute little tea towel? That might be what I'm working with as far as gifts go this year. I have always been a terrible gift giver. Even when we weren't on such a tight budget. I think it's because I just want to buy everything for myself (THAT'S SO TERRIBLE). I have always liked making gifts though, which is lame because when you see a homemade gift that isn't from a child you might be all UGGGH. When I was an unpaid intern, I made everyone in my family homemade gifts almost entirely out of buttons. My mom - button snowman ornaments (that I haven't seen in a while now that I think of it MOM). My sister - an arrangement of buttons in the shape of an M. My dad - a rendition of his beloved old truck in BUTTONS. I was so poor. This has been one of my favorite recipes since I started baking. If you follow me on Instagram, you know I made a batch of these the night I went into labor with Ruthie and reaaaaally wished I had stashed the pan in my hospital bag (didn’t even get the chance to eat ONE 😩). These are SO simple, there are 5 ingredients. But the flavor is insanely rich and chocolatey. Everyone likes their brownies a little different, I like mine melty and gooey and fudgey and these are where it’s at. The brown sugar gives them a chewy texture and amazing caramel flavor. Be careful not to bake longer than needed. I’ve over baked a few batches and they get a little fluffy and less dense. It’s also important to really cream the heck out of the butter and sugar (quick tutorial here). You won’t find any oat flour or flax seed in this recipe unlike many of my others. Though I do usually try to get the most out of what I eat, sometimes that means just making something super delicious and enjoying the heck out of it. Or sharing it with buddies! Recipe clipped from an old (like, really old) box of C&H sugar. Molasses is weird and gingerbread cookies and cake to me as a kid were a waste of time because where is the chocolate? It kind of LOOKS like chocolate but SURPRISE it tastes like mineraly spicy sweetness. For a while growing up, my parents had two cows. I remember being fairly terrified of them on account of their massive size but also curious about them for the same reason. The curiosity part led me to lick their mineral block which is flavored with molasses...possibly furthering my distaste for the stuff. I still sort of associate it with livestock, but I also wierdly love it. But old me is reaaaally into molasses. I can remember the first time I ate it and thought "dang, this isn't just cow good, this is people good too". I was strolling through a farmers market in L.A. while visiting my bother (a farmer's market that was so totally different than the farmer's market I'm used to in the parking lot of Rural King on Saturdays) I casually squeezed this tube of brown stuff that I assumed was chocolate into my iced cold brew with cream (this was pre actually liking coffee times). Well it wasn't chocolate, it was molasses. And it turned out to be super delicious paired with the really strong brew and delightfulness of the cream. That was the moment my taste buds shifted from toddler to refined old person. I added a little bit of steel cut oats on a whim because I like weird textures in my granola but you can totally replace with more rolled oats. I have used both pecans and walnuts with great results. AND if you aren't THAT into molasses, you can use some honey or agave instead of the full dose of the brown stuff. I'm writing this next to a sleeping baby boy while Austin hangs out with Ruthie. I've gotta end it here because I can hear him snoring THEREBY failing at his fatherly duties this evening. This is not just a variation of sweet potato casserole. Ok this is pretty much a variation of sweet potato casserole, but it's for breakfast! Or any time. But I am always looking for new breakfast ideas so IT'S FOR BREAKFAST. Whyyy is breakfast such a struggle? I used to just eat cereal. my mom bought all of the good kinds (PB crunch, Rice Krispie Treats, Cocoa Pebbles, Honey Bunches of Oats, ECETERA) and we always had like 7 different boxes open at once. MAN, remember Rice Krispie Treats? They still make them in case you're curious. Rice Krispie treats cereal carried me through two babies worth of morning sickness. Breakfast used to be easy. Cereal ALWAYS sounded good. And I thought I was doing myself a favor and eating something incredibly wholesome 🙏🏻. Since leaving college, breakfast all of a sudden is this big ole hassle. I quickly realized that cereal is usually pretty devoid of good for you stuff, and it somehow makes me bottomless-pit hungry by 10 AM. So I ditched that habit and found out that NOTHING else sounded good. The only thing I feel like eating is a nice lil chubby donut or a stocky lil friendly muffin. Having kids has changed things a bit in that I now make a substantial breakfast for them every morning (oatmeal, cheesy eggs, egg sandwiches, pancakes, French toast) but I still pretty much have to make myself eat at the unearthly hour of their waking. SO since I'm stressed out abut breakfast enough to write 5 paragraphs, I decided I needed to make some sort of bakery dessert-healthy veggie packed breakfast FUSION and call it breakfast crisp. This could easily be made with butternut squash or pumpkin. I wanted to pack in the protein by adding greek yog and I also wanted it to have as many oats as a bowl of oatmeal. It's basically like a crisp with massive amounts of crumb topping. Austin refused to believe it was breakfast and ate pretty much the whole thing after dinner all three times that I made it. This could totally be used as a non-marshmallow containing version of sweet potatoes casserole for your thanksgiving spread but I LOVE the marshmallow version so I'll be having this one for breakfast instead. Pumpkin purée is a staple I buy year round because I just looove the pumpkin vibes. But also because it's like reaaaaally really healthy. I wish there would a pumpkin specialty option in college "hi I'm a dietitian specializing in pumpkin purée", I could put PP after my name and be very very distinguished. It's so full of fiber (ps I love fiber, if there is one thing you can do to be healthier right effing now it is to eat more fiber) and vitamins and it couldn't be any more versatile. I put it in everything from oatmeal to pasta sauce just to add a little more good stuff to our day. I figured it was probably possible to make at home but I had somehow never done it before. Last year, we grew 400 butternut squashes and I roasted them all so I felt fairly comfortable in my abilities. The "recipe" will require you to buy a sugar pie pumpkin. SUGAR PIE. That's the cutest thing I've ever heard. You don't have to tell me twice. I've also seen them labeled as cheese pumpkins. Not quite as cute and I don't understand it but I'm just the messenger. The guys you are looking for are small and roundish and smoothish and sweeter and less stringy than jack-o-lantern punks. I roast pumpkin, butternut, acorn, and spaghetti squash in the laziest fashion imaginable but one that is also very effective: I put the darn thing in the oven whole (after removing the stem). I once went to a cooking demo where the chef stuck a butcher knife into a butternut squash and then hammered on the knife with a rubber mallet to cut it into chunks. Like wtf! Roast the thing whole with a few fork holes and save yourself a finger or two. And there is no storage space in my kitchen for a rubber mallet. 2. Poke a few fork holes into a sugar pie pumpkin and place on a rimmed baking sheet to catch drips. 3. Bake for about an hour - I like to give it a test squeeze to make sure it's soft (wearing an oven mitt). 4. Slice open and gently scrape out seeds and any stringy pieces. Use a spoon to remove pumpkin from skin. 5. Puree until smooth, adding a little water if needed. 1. I've made every pumpkin muffin on the planet and this one is my fave. 2. Pumpkin pie oatmeal in a slow cooker. 3. Super quick and simple savory pumpkin soup (I added crispy fried sage leaves 💁🏼). 4. This pumpkin baked ziti with sage and sausage I WANT TO LAY IN THIS. 5. Stir it into plain yogurt with honey and pumpkin pie spice, mix in crumbled Graham crackers. 6. PUT IT IN YOUR CHILI. Or make this super healthy, hearty pumpkin chili from Delish Knowledge. 7. Make this completely insane pull apart bread with pumpkin, BOURBON, and candied pecans. 8. 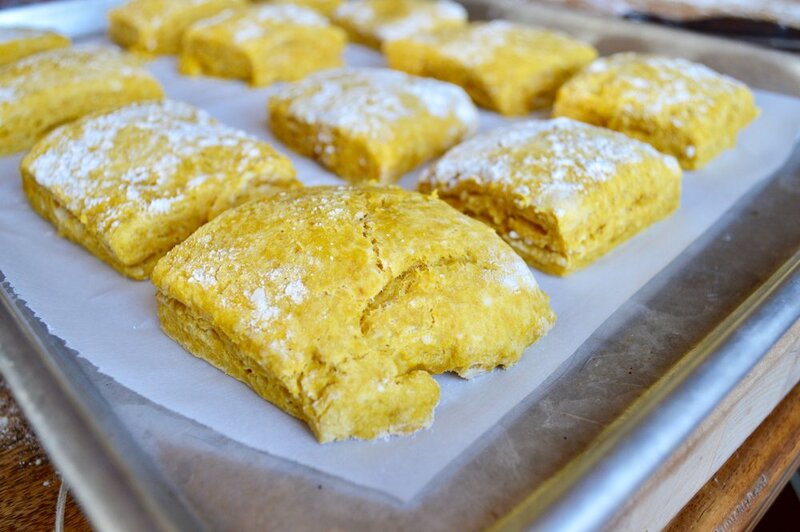 Bake some foolproof pumpkin biscuits and impress everyone you've ever met. 9. Make a seasonally appropriate version of hummus. 10. Butternut mac n cheese is a long time fave but How bout dat PUMPKIN MAC N CHEESE?? Saves you the trouble of roasting and pureeing a squarsh if you go canned. 11. P S L At home! with REAL punkin! I looooove the overly sweet drank but I no longer have Starbucks cash flow. Here's a great recipe if you're down to clown. 13. Pumpkin granola (then ADD IT TO PUMPKIN YOGURT AND EXPLODE). 14. Pumpkin nice cream with BONUS pumpkin seeds. 15. And finally, a delicious take on pumpkin pie that I wish was sitting in front of me right now. Super easy, not too sweet, toddler fave. Everything you need to know about these sort of larabar-esque creations. I wrap them individually and throw a few into the diaper bag before. I also eat them with coffee and have them for dessert 🤷🏼‍♀️. I am late to the the banana ice cream game, I know this. But I didn't believe that it really was as good as people were claiming. I mean, frozen overripe bananas? I just assumed whoever said that it was delicious meant it was delicious for not being real ice cream. But it is even delicious COMPARED to real ice cream. Something magic happens when you whip frozen bananas into a fluffy, creamy cloud of soft serve consistency. I crave it like everyday. And I am a person who honors my cravings. If I want chocolate I don't eat chocolate flavored yogurt. I eat chocolate. When I want ice cream...I eat ice cream. Like, the good stuff. So when I say I crave this ice cream...you can know I mean business. My fave addition has been peanut butter, vanilla, chocolate chips, and a little flaked sea salt. UNTIL I added pumpkin. There was something suddenly caramely after adding pumpkin and almond butter. Top it with the pepitas if you're feeling fancy but it's just as good without and takes about 5 minutes to make. I pretty much buy bananas to freeze them now. I like to peel and slice or break them up, freeze on a baking sheet for a few hours, and then toss into a zip-loc bag. You guys, I'm watching Gilmore girls again. I literally just wrote a post on how watching TV makes me feel unproductive and here I am glasses askew, hair a mess, somehow in the middle of season 3. Also, after hearing Suki mention fried marshmallow pie in an ep, I stumbled upon a blog that recreates food inspired by TV shows. Take a moment here to picture me at my desk at work, searching the internet with the intention of finding the address of my next appointment and coming up for air 3 hours later after reading a 15,700 word article on the complete life story of Casey Affleck. I'm planning a re-do trip to the pumpkin patch soon and will be making my own pumpkin puree. Stick around for over zealous pumpkin insanity the rest of the month! Candied Pepitas recipe from Martha Stewart (duh).